^ a b c d e Stueck 1995, p. 212, 訳書, 249ページ. ^ Stueck 1995, p. 211, 訳書, 249ページ. ^ Stueck, 1995 & 訳書, 240-241ページ. ^ Stueck 1995, p. 214, 訳書, 251ページ. ^ Stueck 1995, p. 214, 訳書, 252ページ. ^ a b Stueck 1995, p. 215, 訳書, 253ページ. ^ Stueck 1995, p. 216, 訳書, 254ページ. ^ Stueck, 1995 & 訳書, 244-245ページ. ^ a b c Mount & Laferriere 2004, p. 123. ^ Stokesbury 1988, p. 145. ^ Mount & Laferriere 2004, p. 122. ^ a b Stueck 1995, p. 225, 訳書, 264ページ. ^ Stueck 1995, p. 225, 訳書, 269ページ. ^ Stueck 1995, p. 229, 訳書, 269ページ. ^ Catchpole 2000, p. 320. ^ Stueck 1995, p. 237, 訳書, 278ページ. ^ Stueck 1995, p. 212, 訳書, 250ページ. ^ Stokesbury 1988, p. 189. ^ Catchpole 2000, p. 322. ^ Mount & Laferriere 2003, p. 123. ^ War Victory Day of DPRK Marked in Different Countries, KCNA, (August 1, 2011) . 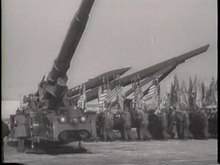 ^ “Defense proposal to authorize the introduction of “Honest John” and the 280 millimeter gun in Korea”, Memorandum of a Conversation (United States Department of State – Office of the Historian), (28 November 1956), http://history.state.gov/historicaldocuments/frus1955-57v23p2/d187 2013年3月21日閲覧, "Summing up, Mr. Phleger stated our view as lawyers that introduction of the two weapons could not be successfully supported as a matter of liberal interpretation, would upset the balance established under the agreement, and would generally be regarded as a violation of the agreement under existing circumstances. He reaffirmed that the agreement should not, however, stand in the way of any action which it might be considered necessary and wise to take, now or in the future, in view of the military and political situation, and with full awareness of all the consequences." ^ a b c Mark Selden, Alvin Y. So (2004). War and state terrorism: the United States, Japan, and the Asia-Pacific in the long twentieth century. Rowman & Littlefield. pp. 77–80. ISBN 978-0-7425-2391-3. http://books.google.co.uk/books?id=D0icvm2EQLIC&dq=korean+Armistice+Agreement+13d+nuclear. ^ a b Lee Jae-Bong (15 December 2008 (Korean) 17 February 2009 (English)). U.S. Deployment of Nuclear Weapons in 1950s South Korea & North Korea's Nuclear Development: Toward Denuclearization of the Korean Peninsula (English version). The Asia-Pacific Journal. 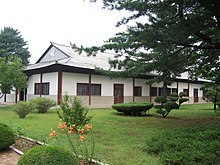 http://www.japanfocus.org/-Lee-Jae_Bong/3053 2012年4月4日閲覧。. ^ “﻿Statement of U.S. Policy toward Korea﻿”. National Security Council (United States Department of State – Office of the Historian). (9 August 1957). NSC 5702/2. http://history.state.gov/historicaldocuments/frus1955-57v23p2/d240 2012年4月17日閲覧。. ^ “Modernization of United States Forces in Korea”, Record of a Meeting (United States Department of State – Office of the Historian), (17 June 1957), http://history.state.gov/historicaldocuments/frus1955-57v23p2/d222 2013年3月21日閲覧, "Sir Harold then asked what plans were being made to inform not just the United Nations but the press and the world at large of the Communist violations of the Armistice. Mr. Robertson said considerable thought had been given to this point but that the Defense Department felt and the Secretary of State concurred that at the MAC meeting it would be inadvisable to submit any supplementary data on violations. A good deal of the information now at hand is classified and would have to be declassified before public use. Furthermore, the Secretary felt very strongly that the release of such information would give the Communists ammunition for their propaganda. We would not, therefore, submit any evidence to accompany the statement." ^ a b Patrick M. Norton (March 1997). 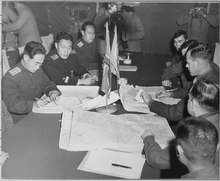 Ending the Korean Armistice Agreement: The Legal Issues. Nautilus Institute. http://www2.law.columbia.edu/course_00S_L9436_001/2005/2a_armisticelegal_norton.html 2013年3月21日閲覧。. Mount, Graeme S; Laferriere, André (April 1, 2004), The Diplomacy of War: The Case of Korea, Black Rose Books, ISBN 978-1-55164239-0 . Stokesbury, James L (August 1988), A Short History of the Korean War (1st ed. ), William Morrow & Co, ISBN 978-0-68806377-1 .